Tarkett's North America sales team will be volunteering at five New Orleans-area nonprofits on Thursday, Feb. 1. This volunteer effort is made possible through Tarkett Cares, a key part of the company’s social responsibility initiative. "Year after year, we rely on volunteers to help us with things that can't be covered by grants," said Gail Gowland, Executive Director, St. Bernard Battered Women's Program. "That includes teams of volunteers coming in and repairing our shelter. The work Tarkett's volunteers are doing will help in the daily lives of those living in our emergency shelter." In addition to employee time, Tarkett is also donating flooring, paint, landscaping supplies, and other building materials to complete projects such as installing flooring, painting murals, creating playground areas, building group dance spaces, creating outdoor picnic and exercise areas, and installing kitchen cabinets and countertops. "We couldn't serve the homeowners of the Lower Ninth without the help of volunteers like those from Tarkett," said Emily Steiber, Volunteer Coordinator, Lowernine.org. "Because of generous volunteers, we've been able to rebuild 87 homes and complete 250 home repair projects for people who lost their homes to Katrina. One family will have their home project completed by the Tarkett team." 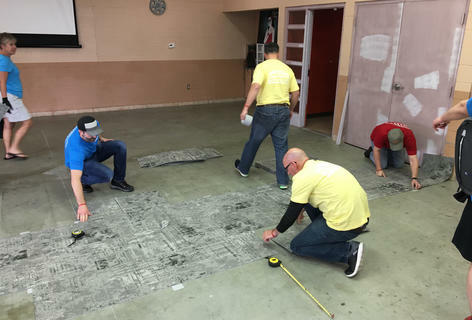 "Tarkett Cares is our corporate volunteering program that mobilizes teams worldwide to share their time and talents with local communities to help people live better," said Jeff Fenwick, President, Resilient, Tarkett North America. "New Orleans is serving as the host city for Tarkett's 2018 North America sales meeting, and this day of giving back is the company's way of thanking and honoring the city for its hospitality." Added Len Ferro, President, Soft Surfaces, Tarkett North America, "Corporate social responsibility is at the core of our business's values, and our team takes this to heart. We've made volunteering a tradition of our sales meeting for a decade, and we're grateful we have the ability to give back to New Orleans while we're here."